Se dutch oven over a couple coals to warm up, then melt the butter in the dutch oven. 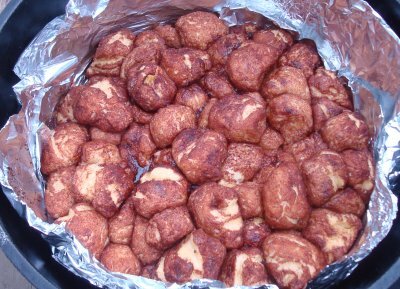 Let me know how you enjoyed your Monkey Bread! this is a really nice wed site I love it thanks so much to the person who made it. this page really helped prepare for the trip I have coming up. and this recipe was absolutely awesome and it tastes so good plus it I super easy to make. I hope everyone gets to try this. I am hoping for more recipes and ideas! thanks once more. What size roll of Pillsbury biscuits? @Wally - They are 7.5oz rolls and make 10 biscuits each. If you take cream cheese, you can wrap it in the biscuits before you apply the cinnamon sugar and butter. My girl scout troop always called it gorilla bread with the cream cheese in. It's pretty good that way! Do you think I could halve the recipe and make it in a 6 qt oven? @Ginger - a 12-inch D.O. is most likely 6 quarts, or 8 quarts. So, the amounts in these recipes should be used. If you're asking about a 6-inch D.O. then that only holds about 1 quart and I wouldn't try to make much in one. My mistake! You are right! It is a 6" not 6 qt. oven. Glad I checked with you first. Great site here. Lots of good ideas. Thank you.